The farm to table thing has metastasized from fetish to fad to flim-flam. What began as a foodie obsession with freshness and an anti-corporate ethos has become a marketing device for conventional restaurants whose idea of a farm is 500,000 chickens stacked in cages sitting on manure lagoon. “Farmwashing” is now common with even fast food joints displaying photos of weather-beaten farmers toiling in their fields. Truth-be-told, most restaurants don’t have access to fresh ingredients throughout the year even if they’re intention is to source locally. It’s hard to know when a restaurant’s claim to farm-to-table is genuine but it’s usually evident in the dish and in the frequency of their menu changes. If they have the same menu every week, they aren’t farm to table. My guess is that Southern Oregon’s Rogue Valley is mostly on the level with their locally-sourced food—the area is packed with small farms, many restaurants have their own gardens supplying produce, continually-changing, seasonal menus are the norm among the restaurants who advertise FTT, and the fresh flavors were explosive in most of the restaurants we sampled. Another indicator of their commitment to locavorism—lots of local wines on the menu. Any discussion of local, sustainable sourcing in the Rogue Valley starts with Ashland’s Standing Stone Brewery. They raise their own beef and chickens from which they get their eggs, and which are fed leftovers from the kitchen and brewery. Most of the grain and hops used to make their excellent beer is locally sourced as well as is most of their produce when in season. Nearly 100% of their paper is recycled, 99% of their to-go packaging is plant-based and 64% of their by-products are reused by local farms and bio-diesel. Their goal is to reach zero-net energy use. The burgers from their own grass-fed beef is excellent and their beer line up among the best—try their Jasmine rice-based lager. It’s outstanding. I have already blogged about New Sammy’s Cowboy Bistro—an extraordinary dining experience with produce and herbs sourced from their own garden. 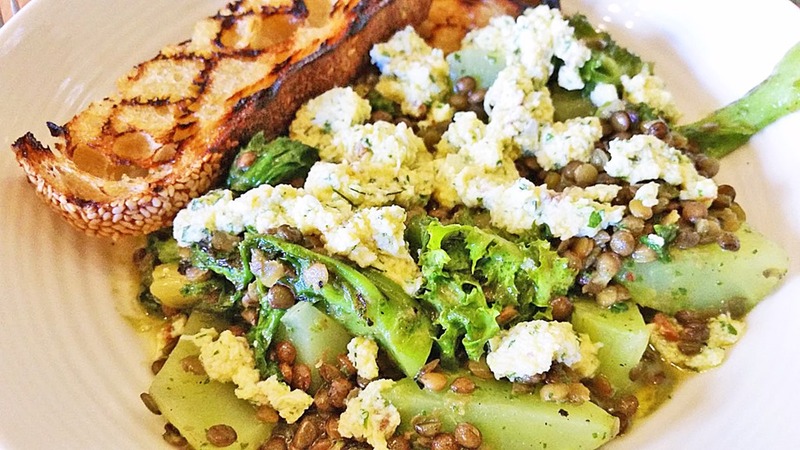 Lorella’s in Ashland has a constantly changing menu of exquisitely prepared, creatively designed Contemporary American dishes depending on what’s fresh that day. The Grilled Celtuce with Braised Frisee, French Lentils, Sauce Gribiche and Grilled Bread (picture above) was one of the more interesting dishes I’ve had this year. Of the many fine dining restaurants in Ashland, Alchemy seemed to have the most creative and enticing menu and it didn’t disappoint. 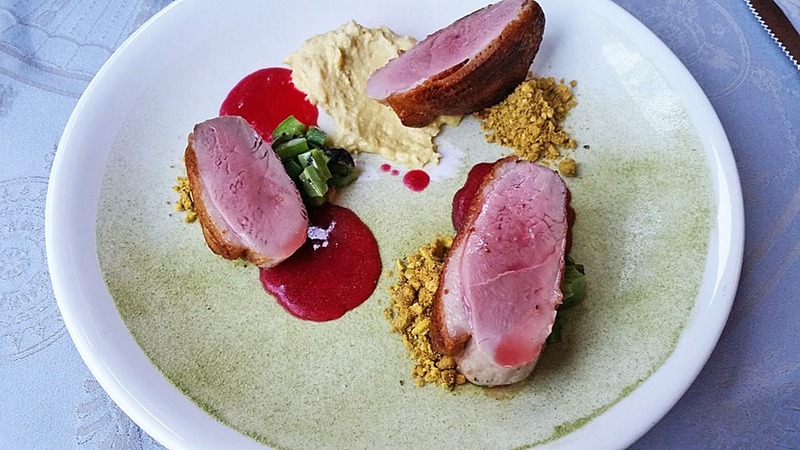 Seared duck breast with prickly pear gastrique, corn puree, charred nopales, and pistachio brittle was a stand out, as was the crab and sea bean salad. If you want to take a break from wine tasting in this up and coming wine region, the burgers at Jasper’s Café are unusual. You can get burgers made from Kangaroo, bison, elk, Kobe beef, pulled pork on wild boar—you get the picture. Even small towns in the area have interesting food. Grant’s Pass features The Haul, a well-priced gastropub advertising local ingredients and featuring an eclectic menu of pizza, pasta, sandwiches, tacos, falafel, etc. all designed and prepared with flare and enough creativity to set them apart. And in Medford do not miss the holy trinity all on the same corner—the outstanding Rogue Valley creamery for some stinky cheese, Lillie Belle Farms Artisan Chocolates for such delights as chocolate covered bacon and smoky blue cheese truffle spread, all washed down with Ledger David’s great wines. As I discussed in an earlier post, Southern Oregon’s Rogue Valley is soon to be on the wine map and they already have a thriving food scene to support it. If you’re into wine and food destinations put this on your itinerary. Like any good movement, farm-to-table has now been severely co-opted. The stories of restaurants deceiving their customers—or flat-out lying to them—have increased. Multiple San Diego restaurants claim to serve Respected Local, Organic, Sustainable Farm X when in fact they’re serving nameless commodity produce that could be from Chile, for all they know. I doubt this practice is restricted to San Diego. For years, since Alice Waters opened Chez Panisse in the early 1970’s, “farm-to-table” meant you were getting the freshest ingredients bursting with flavor, locally-sourced from people who cared about the livestock and chickens they raised and who depended on other members of their community for their livelihood. It was an acknowledgement that food is linked to the seasons and comes from the labor of actual human beings who are dedicated to providing sustenance for their community, a marriage of aesthetic refinement and moral commitment. Today, the language of “farm-to-table” has been tarnished by hucksters. It’s the equivalent of “green-washing”, a deceptive marketing ploy that defrauds customers who pay a premium price for ordinary produce, rips-off local farmers and farmworkers by using their brand name without purchasing their product, and harms those restaurants and chefs who really are providing an honest, local product to their customers. Like the word “natural”, the phrase farm-to-table is so open to interpretation in can be endlessly abused. After all, isn’t all food sourced from a farm? Even McDonald’s has gotten into the act with their “What We’re Made Of” and “farm to fork” campaigns in an attempt to convince customers of the high quality of their ingredients. It is probably time to retire the phrase. There are many restaurants who do it right but it is increasingly difficult to know who is legit and who isn’t. The genius of contemporary capitalism at work. “If you drew a 100-mile circle around each city in the U.S. and then you looked at the capacity of the existing farmland, you’d find that 90 percent of the people could be fed within those circles,” says Elliott Campbell, an associate professor of environmental engineering at U.C. Merced who co-authored the study. In other words, the study didn’t measure how many tomatoes, oranges, or cucumbers could be grown in a 100-mile radius of cities—it measures calories from cattle feed. While that might be a useful study for academic purposes it has no relation to real-world food consumption. The conclusion is just misleading. It should be palpably obvious that most regions in the country cannot grow food all year round and many foods cannot be stored over long periods. A winter diet of potatoes and beets might be virtuous but it will neither be tasty nor nutritious. The case for specialization is perhaps nowhere stronger than in agriculture, where the costs of production depend on natural resource endowments, such as temperature, rainfall, and sunlight, as well as soil quality, pest infestations, and land costs. Different crops demand different conditions and vary in their resilience to shocks. There is a good case to be made for locavorism—when compared to industrial agriculture local food tastes better, it is usually more healthy, and there are good community-based reasons for supporting your local farmer. 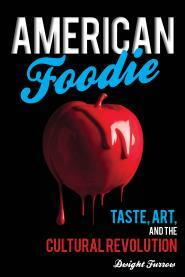 In other words, the argument is primarily an aesthetic argument—local foods give more pleasure. So we should support locavorism where possible without rigidly insisting that our food supply be entirely local. Should Restaurants Feature Local Wines on their Lists? As in the parable of the blind men describing the elephant, where you’re placed—as a winery owner, a restaurant owner, a chef, a sommelier, a booster of local wines, a wine importer or distributor and not least, a wine-loving restaurant patron—will powerfully color your conclusion. That is certainly true but I think two perspectives should take precedence—diner’s preferences and the vision of the chef or owner. No restaurant is obligated to serve local wines if they do not enhance the chef’s food or fit with the vision of the restaurant. As a diner, it is that vision that I want to experience. Furthermore, in a Greek restaurant I prefer Greek wines, in an Italian restaurant, Italian wines since in these traditional wine growing regions the food has evolved with the wine and they usually pair well. But for restaurants that advertise as farm-to-table or claim to be an authentic expression of their region’s cuisine it is a travesty if they don’t include local wines. Why are grapes any less local than other food products? Furthermore, such restaurants have an obligation to design some dishes with local wines in mind. Their advertising is creating that expectation and they should fulfill it. When I peruse a wine list, the first thing I look for is the local wine selection and almost always choose from it. No doubt there should be sufficient diversity on the wine list to make it interesting and to give diners meaningful choices. But that diversity should include local selections if there are quality local wines available. Life is suffering and then you die, according to the wisdom of Silenus, the mentor of Dionysus in Greek mythology. Nietzsche argued that art was invented as a response to this pessimistic view of human life. We dream, invent, seek rational order and symmetry so that we can escape the dark night of this terrible vision. A world of suffering is redeemed by a world of illusion, reality wrapped in a veil of beautiful appearances. But art that embodies only these Apollonian elements will be merely pretty, superficial, what we today call Kitsch—a deliberate avoidance of the realities of existence. For Nietzsche, a genuine affirmation of life must involve the judgment that what is terrifying and painful in life can nevertheless be good—a celebration of reality’s incessant process of creation and destruction into which the individual disappears in moments of intoxicating ecstasy, taking pleasure in the sheer changeableness of things. Genuine art requires both beautiful illusion along with an ecstatic affirmation of suffering life, via Dionysian revelry. There is something right about Nietzsche’s merging of the Apollonian and Dionysian because great art is not merely pretty but involves taking pleasure in what is painful, overwhelming, horrific or fearful. This Dionysian element is an obstacle to the notion that culinary preparations can be works of fine art. We will eat only what tastes good. We don’t want food that is horrific or fearful. We cover up the fact that food originates in death, destruction, and endless toil and prefer to dine while entertaining Romantic fantasies of far-off exotic places, in happy, conflict-free communion with family and friends. A good meal is a sensuous delight devoid of thoughts of pain and suffering. It partakes of the Apollonian only, unless Dionysus arrives with an excess of wine. The artist Zev Robinson’s new project (h/t Elatia Harris) promises to disrupt our exclusively Apollonian approach to eating. In collaboration with local chefs, caterers and Spanish restaurants, tapas and sit down meals would [be] consumed surrounded by art, photography and video installations that gives the experience a cultural and geographical context – the faces, hands, toil and plants and animals that enable us to eat. Traditionally, it has always been that way when people produced their own food, and only in modern urban life have the two – food and agriculture – been separated. The Art and Politics of Eating is an experience in bringing the two back together. It may be somewhat disconcerting to some, but it is a thought provoking experience and glimpse into a reality to which urban living makes us oblivious. Nietzsche’s idea is not that art must be ugly or painful to view. Rather, his idea is that the illusion that is the work of art must be presented in a way that dissolves the illusion, that reveals its rootedness in the creative destruction of the material world, and that allows us to experience the joy of absorption in that world. As Robinson points out, our modern way of eating obscures that relationship. Recent attempts to reconnect food and agriculture through farm-to-table dining and locavorism are attempts to pay homage to Dionysus, and Robinson’s project is an interesting way of reinforcing that connection. The title of the article is misleading—it is really about how the meaning of “hipster” changes once ordinary people start to adopt hipster style (and it becomes a commodity exploited by capitalism). The real trend setters will move on to something new once their innovation is no longer a badge of distinction. Part of contemporary hipster culture is caring about the provenance of your food and drink. If beards, flat caps, and tattoos are on the way out, will locavorism and the whole phenomenon of wanting a personal connection with what we consume go with it? I hope not because that movement is a form of resistance to the industrial food complex, and it is important to keep up that resistance. Has locavorism transcended the stage of “fashion trend” to become more firmly rooted in culture? What say you hive mind? It is lovely to know the person who grows the kale you’re eating for dinner. 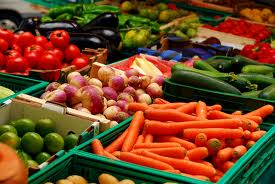 Collecting a box of fruits and vegetables sourced from your local CSA guarantees fresh, organic meals everyday. It is romantic to revisit bygone practices like canning or fermenting your own sauerkraut. 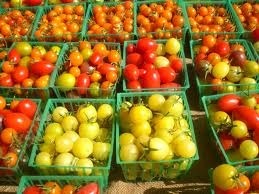 And those unique, flavorful heirloom tomatoes are a real treat. Locavorism not only provides us with great food, but issues a double dollop of self-esteem in knowing that one is living ethically and supporting a worthy cause while enjoying artisanal products. But investing too much in all this “virtue” helps us ignore the problems in our food system that locavorism is powerless to solve. Many people would starve if they depended on their local food supply, because most people do not live near farmers who supply all-season produce in sufficient quantities to feed everyone. 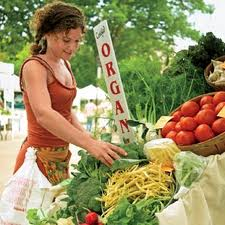 Although locavorism touts its improved carbon footprint, it is not at all clear that the low-volume, short-haul shipments of local produce via truck is more energy-efficient than high-volume, long-haul transportation via train and ship that is a substantial part of industrial agricultural transportation. At any rate, it is largely meat production that is the egregious energy user and most of the emissions involved in food are the result of production, not transportation. Locavorism gets its cachet from real concerns about the impact of agribusiness on food security, soil depletion, antibiotic abuse, and genetic diversity of crops, but it is more of a business niche for specialty producers supplying status food to gourmands and fans of organic food, not a solution to the problems of agribusiness. So should we cancel our CSA accounts and return to shopping at supermarkets? I don’t think so. Locavorism is useful because culture is important for the transmission of norms. It is important that individuals pay attention in their own lives to sustainability issues if a mass movement toward sustainability is to be created. Locavorism is a symbol of that attention, not a solution, but symbols are important for generating expectations and keeping pressure on agribusiness to clean up its act. But we should be under no illusions that we are doing more than manipulating symbols; and especially be under no illusions that private virtue can somehow substitute for public policy. Locavorism, the idea that eating locally-sourced food is inherently virtuous and environmentally responsible, has become increasingly popular as a “food philosophy”. The standard argument in support of locavorism is that shipping industrially-produced food half way around the world so we can have tomatoes in January is a waste of resources and a threat to the environment. 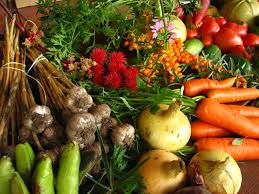 We should instead eat only food grown locally and in season, in order to reduce our carbon footprint. I don’t normally take libertarian arguments too seriously but this article by Pierre Desroches and Hiroku Shimizu does a pretty good job of debunking the concept of food miles and its impact on the environment. Their main point is that long distance, sea transport uses less energy per unit of food than even a short car trip. They go on to claim that the promotion of local food is dangerous and is ” a marketing fad that frequently and severely distorts the environmental impacts of agricultural production”. Of course “food miles” is not the only issue with regard to industrial agriculture. But the linked article is correct that it is too simplistic to think eating locally will do much to save the planet. Furthermore, in many parts of the world, including the U.S., there isn’t enough food for everyone to eat only locally. Nevertheless, eating locally can be defended on other grounds. Locally grown food is usually fresher, safer, more nutritious, it tastes better, and it is good for the community as a whole to support local businesses. Locavorism is not a panacea for solving the problems of industrial agriculture. It is just a good way of enjoying fresh food if you can take advantage of it. The Anxiety of Influence. Molecular gastronomy expert Grant Achatz, in his new restaurant called Next, is serving up dishes by the man who started it all—Ferran Adria. Check out the slide show. Edible Helium Balloon. Despite the travails of opening a new restaurant, Achatz has lost none of his experimental elan. Here is a video in which he makes an edible helium balloon. Are local food sources more friendly to the environment? Not necessarily, claims Jason Clay. This needs explaining. It really does. “Gourmet” pet food has been around a long time. But lobster consommé? Have these people ever watched a dog eat? The Taste of Austerity. Italy’s recession is forcing Italians to seek out dishes using offal and stale bread. Zagat’s 10 signs of a bad restaurant.